"Last night's mini-Download in Dublin was excellent. 7 hours of entertainment spoilt only by Def Leppard's same old same old. Tesla, who I have to admit I had never heard much of, started off proceedings admirably. Journey, I band I have always quite liked in a AORd (odd) sort of way continued by playing hits old and new. 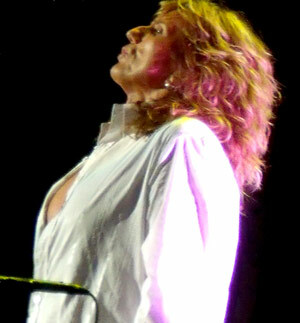 David Coverdale then arrived on stage and took the place apart. The first three tracks from last year saw Bad Boys replace Fool For Your Loving (bah, humbug) but the rest stayed much the same - with the addition of Guilty of Love. The intensity with which the songs were delivered was superb, with Coverdale as good as I've heard him. We were at stage right and during the solos he was enjoying a great rapport with the choir. Well done David Coverdale. After about 6 versions of the same song from the Leps we moved to the exit (to wait on the kids) and were amazed at the number of people leaving. 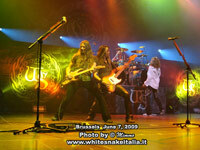 Whitesnake must be popular in Ireland as the same thing happened last year in Belfast." "I have written a few comments on Whitesnake in the past as I am passionate about the group and its history, but yet again I feel it has now become a total waste of time to see David Coverdale and band, as the setlist will be always the same. Do not get me wrong. 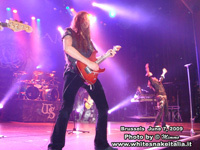 If you love 1987, which most Whitesnake fans do, then you will enjoy it. But to me its boring. David Coverdale has the most brilliant bluesy singing voice, so why the need to scream out all the time? The better songs on the day were Ain't No Love and The Deeper The Love, because he sang them. As for the rest of the set, it was five from 1987, four from Good to be Bad , and two from Slide it In. David stated during the show that he had to get a move on in order to make most of his allocated time on stage, so why the chuff have a guitar and drum solo!?? Also, if it is supposed to be a classic rock line up then play your CLASSICS: Lovehunter, Ready and Willin', Lie Down, Dont Break Heart My Again, Walking in the Shadows, Wine Women and Song to name but a few. I think the reason he didn't play them was summed up by Guilty of Love, which hardly anyone around me knew. I would love to say Whitesnake put on a classic show but I would be lying, the bands before them on the day were a whole lot better and as a major Whitesnake fan it hurts me to say that. I wish them well but I will not be wishing to see them until things change."